I find it very interesting how we continuously find such unique and useful remedies in nature that we have not already discovered in the laboratory. 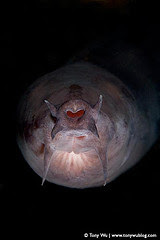 The hagfish, which is a marine craniate, lives in deep water on the ocean floor. When captured in the jaws of a gill-breathing predator it releases a fibrous slime which when combined with water, turns into a thick and sticky gel. It has recently been discovered that this amazing slime is very special because it contains thread-like fibers which are similar to the silk which spiders make. It is remarkably strong and has a tensile strength similar to that of high-grade steel. It is thought to have future uses in medical field, treating burn victims, and possibly even people with skin cancer. I find it fascinating how hard we work to synthesize artificial products, when we are often surrounded by much superior products. It demonstrates the diversity and awesomeness of natures. I am curious and excited to see the secrets nature is still hiding from us.